Indigenous Peoples' Day is celebrated in some localities in the United States on the second Monday in October. This observance was originally designed as a counter-celebration to Columbus Day, a federal holiday which celebrates Christopher Columbus's arrival in the Americas. Columbus Day was proclaimed a federal holiday in 1934. However, in some states it is not observed as a state holiday. Some think that European conquest of North America, which followed Columbus's arrival, is not something that should be celebrated because it led to massacre and forced assimilation of Native American People. In 1992, the city of Berkeley, California symbolically replaced Columbus Day with Indigenous Peoples' Day. This holiday was designed to commemorate the history of Native American peoples and to promote their culture. After Berkeley's move, some other cities followed suit. The entire state of South Dakota does not recognize Columbus Day and celebrates Native American Day instead. 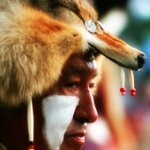 Since 1993, Berkeley has held an annual festival and pow wow on Indigenous Peoples' Day. Some Native Americans across the country commemorate this day with ceremonies. For example, a sunrise ceremony is traditionally held on Alcatraz Island in San Francisco, California.